In support of the second annual Global Meetings Industry Day, Sandton Convention Centre’s team dressed to impress in a collage of blue. 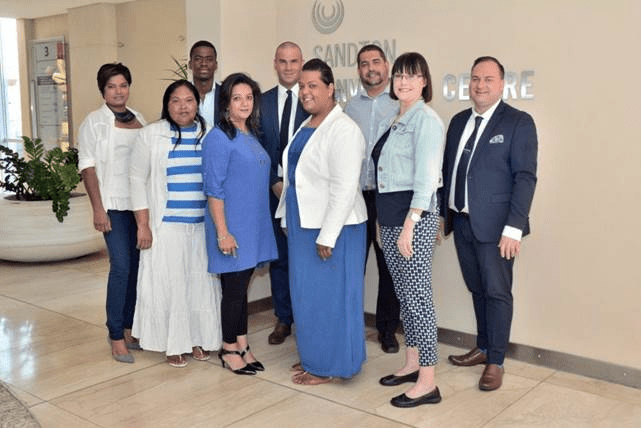 As a leader in the industry, the team at Sandton Convention Centre has come together to support the second annual Global Meetings Industry Day which is being celebrated by the MICE industry today, 6 April 2017. Events are held across the globe to demonstrate the measurable impact that meetings have on businesses, economies, and communities. Tourism is one of the key focus areas outlined in the government’s Nine Point Plan to reignite economic growth and create jobs in South Africa, and the business events industry is a critically important component of that plan. The South Africa National Convention Bureau (SANCB), a business unit of South African Tourism, commissioned an extensive three-year study to determine the economic value of the business events industry. Two years into the study the estimated total direct spend of business tourists in South Africa was R42.4 billion in 2015. This figure is based on how many delegates attended business events here that year, as well as what they spent before, during and after the event. It’s also estimated that the international MICE industry supported some 280 000 direct and indirect jobs in South Africa in 2015. This includes jobs in the transport, infrastructure and other sectors. The SANCB study also indicated that around half of the delegates travelling to South Africa for business are accompanied by another person on these trips, with a large number of interviewed delegates accompanied by over three companions. This has a knock-on effect for not only the accommodation sector, but also the hospitality, transportation and retail sectors.